The Ishikawa diagram, Cause and Effect diagram, Fishbone diagram — all they are the names of one and the same visual method for working with causal connections. Originally invented by Kaoru Ishikawa to control the process quality, the Ishikawa diagram is well proven in other fields of management and personal scheduling, events planning, time management. 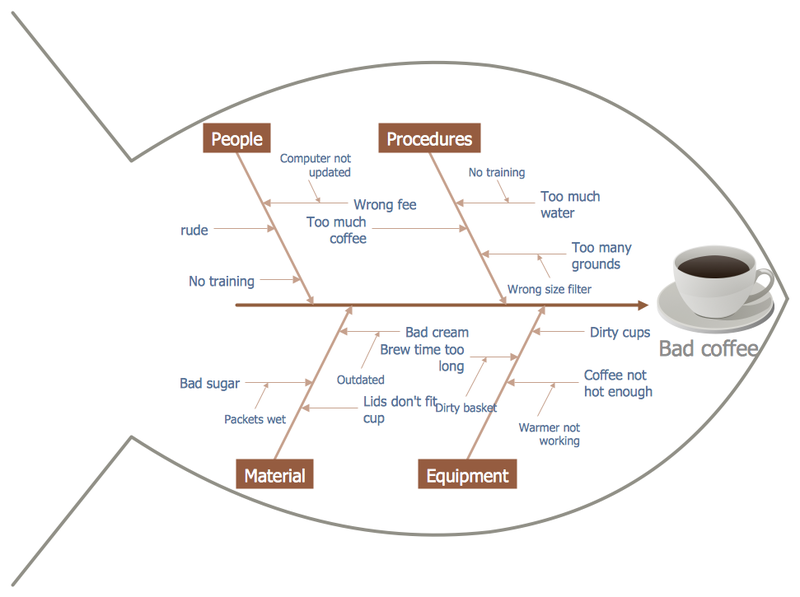 The Fishbone diagram is one of the main tools used to measure, assess, monitor and improve the quality of production processes and is included to the list of Seven tools of quality control. The Ishikawa diagram allows you to organize the reasons in a convenient visual format, to find among them the main, to identify the major causation factors and consequences in the interesting problem or situation, and also to prevent the occurrence of undesirable factors and causes. The Ishikawa diagram is a chart in the form of a fish, whose head is a problem, the fins are variants for its causes. At this it is important to indicate the really essential reasons, without going into too much detailing. To design easily the Fishbone diagram, you can use a special ConceptDraw DIAGRAM ector graphic and diagramming software which contains the powerful tools for Fishbone diagram problem solving offered by Fishbone Diagrams solution for the Management area of ConceptDraw Solution Park. Fishbone Diagrams Solution contains the Fishbone Diagrams library with a lot of ready-to-use vector objects by using which a Fishbone diagram can be simply created even by a beginner. This solution provides also variety of quick-start templates, examples and samples demonstrating fishbone diagram problem solving. Each of them is available at ConceptDraw STORE and can be used as a good base for designing your own Fishbone diagram without efforts. 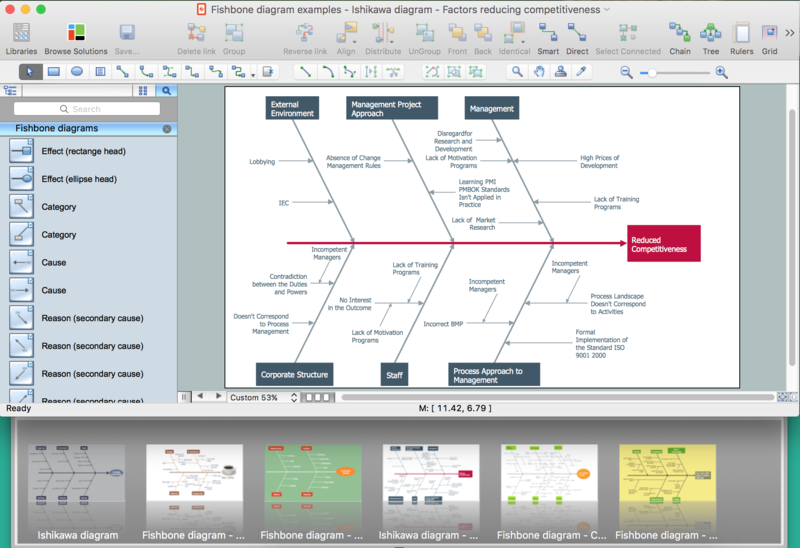 Fishbone diagram is a perfect problem analyzing and solving graphic method. To make your diagrams even more attractive and successful don't afraid to use bright colors and colorful clipart from other libraries of ConceptDraw Solution Park. The samples and templates you see on this page were created in ConceptDraw DIAGRAM using the Fishbone Diagrams Solution tools and are available for using from ConceptDraw STORE. An experienced user spent 10 minutes creating each of them. 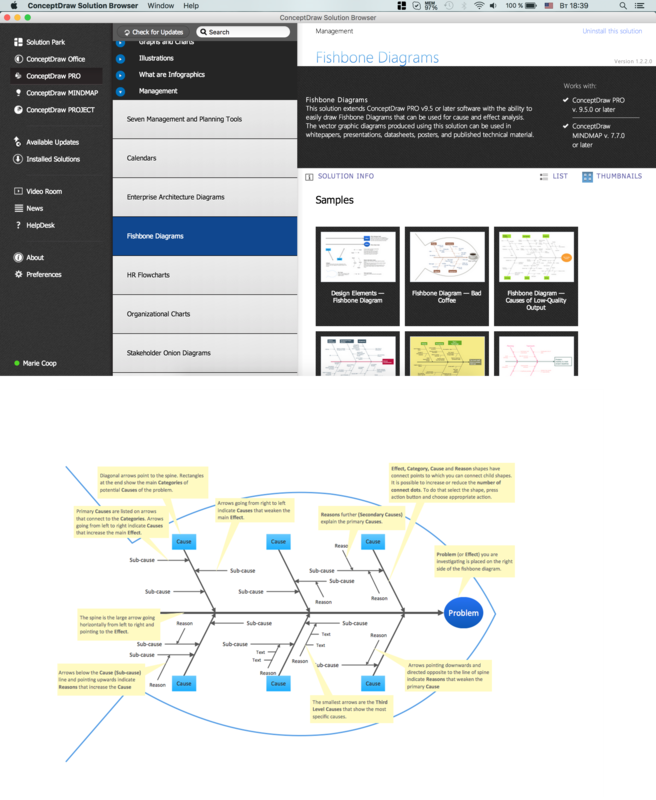 Use the Fishbone Diagrams Solution for ConceptDraw DIAGRAM Solution Park for fast and effective cause and effect analysis and fishbone diagram problem solving. Human resource management (HRM) is a professional discipline which oversees and manages an organization's human resources, and aspires maximize employee performance for an employer's strategic objectives. The HR Management Software is an incredibly powerful tool for those who need to analyze or present human resource process flows in a visually effective manner. Fishbone Diagram, also referred as Cause and Effect diagram or Ishikawa diagram, is a fault finding and problem solving tool. Construction of Ishikawa diagrams is quite complicated process and has a number of features. Fishbone Diagrams solution included to ConceptDraw Solution Park contains powerful drawing tools and a lot of examples, samples and templates. Each Fishbone diagram example is carefully thought-out by experts and is perfect source of inspiration for you.